When you choose pet sitting with a host family, it's good to know how to get your animal ready for pet sitting with a family. He's going to stay in new surroundings and should feel at home while you’re away. There are essentials tasks to enable you to make a better choice of host family. Once you’ve found a suitable pet sitter, you should organise an initial meeting before the sitting takes place. This is a vital step before entrusting your pet to its new family. 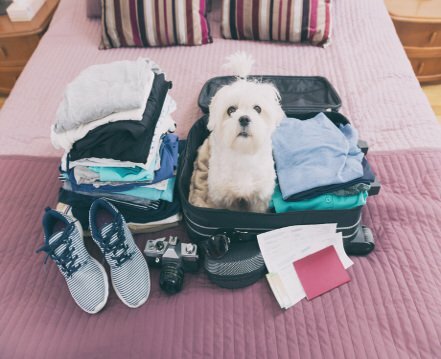 When you meet the host family, it’s vital to take your pet with you. It’s not only a chance for you to get to know the sitter, but also for your pet. By taking your pet with you, it also enables it to get used to being with its future sitter. Having got to know the sitter, it’s also important to visit their home and see the surroundings, where our pet will be staying. During the visit, look out for anything that could pose a risk for your pet. If your animal is prone to running away and you choose a pet sitter living in a house, you should check out the garden to see the state of any fencing or wall: is it secure? Is it high enough? Is any work being done ? Does the pet sitter have any pets ? Pet sitters are animal lovers, so they are likely to have their own pets. If this is the case, you should arrange for your pet to meet the sitter’s pets to see if they will get on. The ideal place to do this is on neutral ground such as in a local park – in order to avoid any territorial fights. Does the pet sitter have children ? If your pet is on the large side, you should check whether the sitter has children. If they do, and especially if they are young children, you should make sure that the sitter is aware of the size of your animal in order to avoid any risk of accidents with the children. When you visit a host family you should also check the accessibility of the sitter’s home for your animal. If your pet is old and has difficulty climbing stairs you’ll need to check that there’s a lift if the sitter lives in an apartment above the ground floor. If you’re happy following the first meeting with the pet sitter you may wish to confirm your choice by organising a trial sitting. This trial could for example just be for a few hours, the aim being to see how your pet reacts to your absence in unfamiliar surroundings. If all goes well with the trial, you’ll then be able to go ahead with the pet sitting with no concerns about the outcome.